Since 1936, this has been the go-to store for auto parts. Because they offer everything a vehicle could need, they are still going strong a century later. And the great news is, you can purchase a NAPA Auto Parts gift card for a discounted price and save money on everything from brake systems & engine parts to seat covers & air fresheners. Keeping your car in good shape has never been this easy! With over 16,000 service centers nationwide, finding an auto center close to you is easy. Stop in any location for expert service on your vehicle, and you won’t be disappointed. Not only do they offer expert services but every repair comes with a warranty for 24 months or 24,000 miles. And just think, when you use a discounted NAPA Auto Parts gift card, you will save money on your entire purchase. Purchase your discounted NAPA Auto Parts gift card today and save money on professional services, brake pads, paint, ignition parts, and more! What’s more, you can use your card once, then use any remaining balance on your next visit. One little card, so much value. Imagine the ease of using your card to pay for your services and parts. And just think, you will pay less money for the very same services and parts! Don’t forget! Gift cards make super presents too! Not only will a NAPA Auto Parts gift card save you money, but Cards2Cash also provides many other money saving options. If you want to save money on outstanding merchandise for your vehicle, be sure to check out our listings for Advance Auto Parts, Nationwide, Auto Zone, Belle Tire, and more. With Cards2Cash, you can keep your car in top shape without going broke! 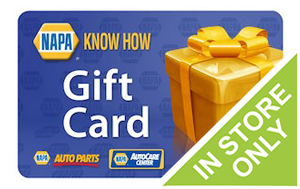 Do you have a NAPA Auto Parts gift card you will never use? Great news! Cards2Cash will pay you top dollar for it. We buy gift cards for gas stations, department stores, websites, and more. Why keep something you aren’t going to use when you can have cash instead! Just stop in one of our retail locations for money paid to you on the spot, or just fill out our easy online form and we’ll get back to you with an offer. Cards2Cash is your one-stop gift card shop!